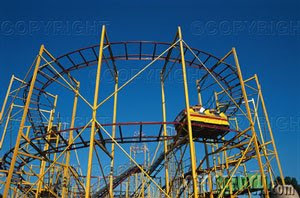 The FamiLee Jewels: Roller Coaster Jewelry? I received another lesson on Sunday regarding free thinking or lateral thinking or "flight of ideas"????? I'm not sure of the correct terminology but basically a lesson in loosening up the way I see things and how I interpret them. I was working the kiosk for The FamiLee Jewels At The Warehouse. Mike Thomas was singing in his own unique style and I was visiting with customers and making a few sales. Everyone was in good spirits as At The Warehouse is closed for the next 2 weekends so we will all be on summer vacation. A customer came in. A repeat customer----a very nice gentleman who likes to purchase our jewelry as gifts. He needed a necklace that reminded him of a Roller coaster. I have to admit...my brain just didn't make the jump. I think it stopped working for a minute or two while I looked at shelf displays and through trays of jewelry pretending to look for Roller coasterish items. Then he picked up one of my wire wraps and said "Something like this. See the way the wire curves around like the track?" My brain shifted to the right.....and I saw Roller coasters. We looked at several pieces. The lady in question liked blue and green not red or orange. She liked sterling silver, not copper or gold. We narrowed it down to one. He chose a round black onyx cabochon with sparkling green inclusions. It was wrapped in swirls of sterling silver wire and he liked the way the anchor wraps on the sides looked like a line of cars climbing the track. This was not my interpretation of the piece. When I made the wrap I was picturing a dark moon in the night sky. But I have learned....my interpretation is not the only one or even the most important one. I make Roller coaster Jewelry!